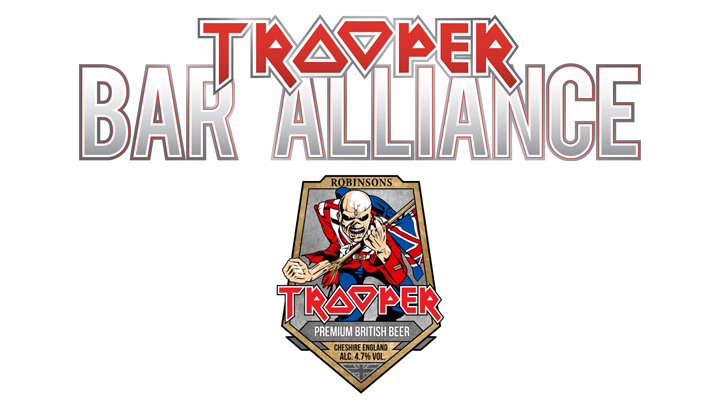 North America (April 25, 2017) – The call has gone out to over 200 bars to join the nationwide “TROOPER Bar Alliance” – the first bar network in the world for rock fans, designed to connect Iron Maiden’s devoted fanbase with the band’s award-winning premium British beer TROOPER. Participating bars or stores will be listed on regional and local event posters around the band’s upcoming tour dates, promoted on social media, and granted access to special promotional materials to show the fans they support TROOPER. Don’t wait – the ranks of the TROOPER Bar Alliance are filling quickly! The TROOPER Bar Alliance announcement comes ahead of the band’s The Book of Souls World Tour, which kicks off its final leg in North America in Bristow, VA on June 3, culminating with two nights at the Brooklyn Barclays Center on July 21 and 22, the second night added due to overwhelming fan demand. The North American Tour encompasses 20 states and 2 provinces across the United States and Canada. By the end of The Book Of Souls Tour the band will have played to close to half a million fans in North America alone. Do you manage a restaurant, bar or retail store and are interested in carrying TROOPER and joining the TROOPER Bar Alliance? Please contact Lanny Hoff at +1 (612) 245-5433 or by email at lanny.hoff@artisanalimports.com. TROOPER is a premium British Extra Special / Strong Bitter (ESB) beer created by Iron Maiden. It is handcrafted at Robinsons Brewery in Stockport, UK. Malt flavors and citric notes from a unique blend of Bobec, Goldings and Cascade hops dominate this deep golden ale with a subtle hint of lemon. Real Ale fan and history aficionado Bruce Dickinson, Maiden’s vocalist, played a major role in developing the unique flavor of the beer, entailing ongoing visits to Robinsons Brewery in Stockport. The TROOPER song was originally inspired by ‘The Charge of the Light Brigade’. It took place at the Battle of Balaclava (1854) during the Crimean War when 600 British cavalries courageously charged the massed Russian artillery. Robinsons Brewery has been based in the heart of Stockport, England for almost two centuries. With 300 tenanted and managed pubs, inns and hotels across the North West, it is one of oldest and most respected names in British brewing history. A proud family of independent brewers, Robinsons is one of the most advanced and sophisticated breweries in the UK, with a worldwide reputation for real ale. It’s also home to the largest hopnik – a device that allows for concentrated hop flavor and aroma – in the world. “From here we apply decades of experience to create exciting new varieties and choices of flavor that will lead us towards our next award-winning beer,” says Robinsons Marketing Director David Bremner. For interview opportunities with Robinsons’ Director of Marketing David Bremner or for more information about Iron Maiden’s TROOPER and the TROOPER Bar Alliance, please contact Lanny Hoff at +1 (612) 245-5433 or by email at lanny.hoff@artisanalimports.com. About Iron Maiden: With over 90 million albums sold worldwide, Iron Maiden is considered one of the most successful heavy metal bands in history, having played over 2000 live shows internationally throughout a career spanning over four decades and dozens of chart-topping hits. Iron Maiden’s famous mascot, “Eddie”, has been a steadfast figurehead over the band’s thirty-eight albums release, including sixteen studio albums, eleven live albums, four EPs, and seven compilations. For more information on the band, their tour and beer, head to http://ironmaiden.com/.